My inspiration was a picture on pinterest that I found and made it making it sitting down. During the development I sculpted the head, body, and tail separate and then put them together after I got the shape I wanted with the scour, slip, stick, smooth trick. while making the shape of it I had to take out extra pieces of the clay out because it was large and big. One thing that helped me a lot was a thin flat piece that made the ears, nose, and tail straight and that made the shape triangular. When I finished the wolf I was happy at how it looked I liked how it looked like an actual statue and when I carved the quotes on the wolf's tail it looked very good and I was happy on how it looked. Although a issue happened with the finished product of the wolf causing it to break off the head and one of the legs but I have a solution to fix it soon. During this project i didn't really know what i was going to do but when I had free time I went outside and saw a lot of leaves in different shades or color and I made it into a circle like a picture I saw with stones but instead Im using leaves like the picture shows. During this art pice I just grabbed leaves the same shade and put them in the circle though it was getting difficult when the wind started to blow because it would move the leaves a bit. When I finished it I was proud of what I did and liked how it looked like a compass. During this project I didn't really have anything to inspire me for this project and I was just going with the flow and doing what I seemed felt right for the project for me. During the development of this I did what I wanted and what seemed cool and made a few points using the crafting knifes and having a lot of circles in it cause I wanted the top to have a ring for some reason. while creating this I was looking at what other people did and kinda took it and made it one of my own but in the end I was kinda ok with how it looked. the end of my art pice I wasn't really expecting my art pice to look like how it is now and to be honest I thought it would end up badly but I'm happy that it turned out looking cool. The images composition improved becauses I learned what the rule of thirds was, the golden spiral, and cropping. I improved my work by following the rules making the pictures better and more interesting. My art has a short story of how I got my art. 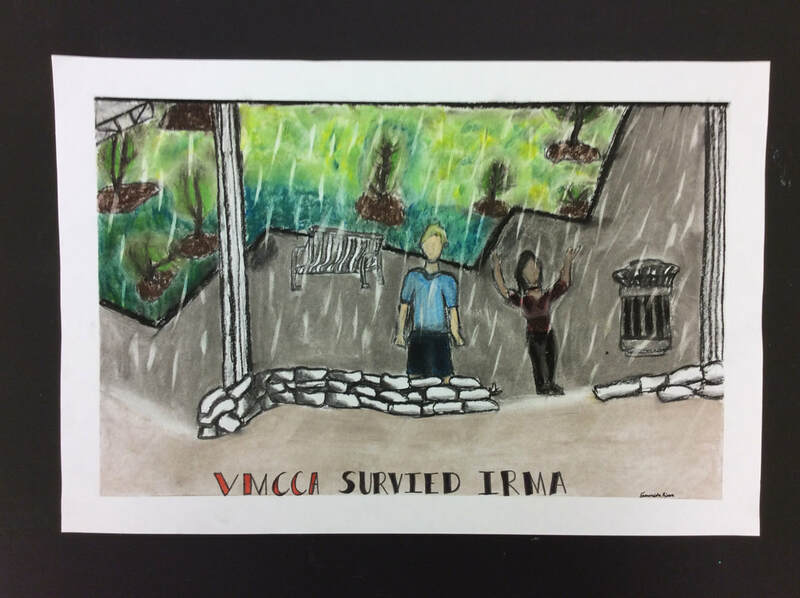 This is a memory, it was the day that VMCCA was preparing for Irma and it was raining that day and no one went outside for lunch. I went outside because I love the rain and so did my friend, for the whole hour we played and had fun in the rain while everyone was inside. My art is mixed with charcoal and chalk pastels. 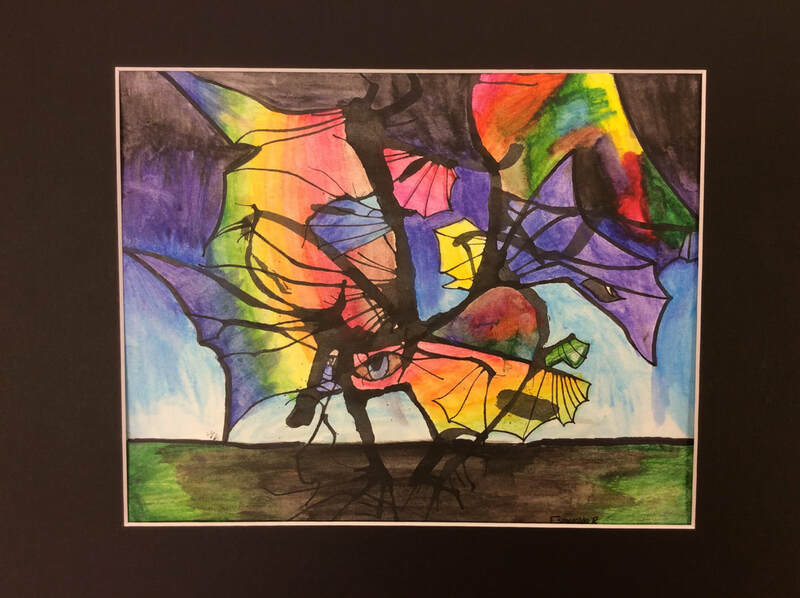 What got my idea of my art was our theme which was given to us by our teacher which was 'Naturescape' to me I think it means being out of where you are usually are and going out of it and doing fun things, and thats how I got my idea. How the finish looked isn't what I expected because I didn't plan on using color in it but I did in end and I love how it looks now. My artwork kinda looks like a demonic mixed animal with a lot of wings. For the water colors I mixed colors together into a fade and blend in together. I just explored how to use the water colors and find what my color scheme would be. I wouldn't really know how it would turn out because I didn't plan on any specific colors for my art, but I actually like how this turned out.